In fact, the CM had also approved the idea of taking the metro towards south of Ahmedabad, too -- towards Dholera, where a modern city in the form of special investment region (SIR) is proposed to developed as part of the Delhi-Mumbai Industrial Corridor. It was to be extended up to the proposed Greenfield international airport, just outside the SIR. The view was, once metro route was finalised towards Dholera, urbanisation would automatically develop in that direction. Meanwhile, latest estimates suggest that the cost of the metro rail project would be much higher than the estimate of Rs 22,800 crore, as envisaged in the detailed project report. 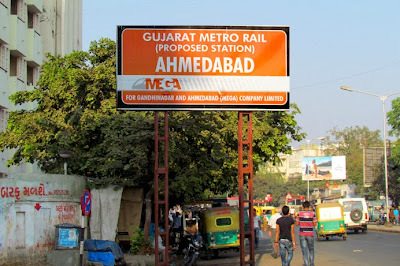 This is because, the sources said, after toying with the idea of running most of the metro overground, the Gujarat government has found that it is not feasible, and about 60 per cent of the metro should run underground and there would no link with Gandhinagar in the immediate future. Earlier, only a small corridor of about 16 km was to be part of the 80 kilometres route of the metro. The change in the route, significantly, would add to the nine-year delay in the metro project. Initially, the delay took place because the state government decided in favour of the BRTS project instead of the metro in 2004-05. In fact, the state government dropped metro like a hot potato, and realized that the delay has cost the state dearly, as several other states have already got their metro projects cleared from the Government of India, and have even got money for themselves. According to officials, "A minister's committee recently rejected the earlier plan suggested by the Metro Link Express for Gandhinagar and Ahmedabad (MEGA) Company Limited. The construction, which was earlier to link Ahmedabad with Gandhinagar, the state Capital, may now start in the old city area first." Significantly, only six months back, the officials were saying that the old city would have very little of metro, as it did not fit into the concept of transport-led growth! "Change in the concept has led to change in emphasis, too.The underground rail network will be first taken up, spanning into two old city directions: APMC (Vasna)-Paldi-Jamalpur-Kalpur to Civil Hospital, and Memco (Naroda) to AEC (Sabarmati). These routes have accorded the highest priority now. Considering the dense population of these localities, digging the underground tunnel will be challenging task. Almost 60 per cent of the rail length will be underground now,'' officials said. Although, I have heard a lot about company incorporation, but I would like to read more on limited company formation procedure personally to get a better insight about it.